Light: Measuring progress toward your goal. Looking at results with an eye toward improving performance. Asking, “How happy am I?” Coming up with ideas for improving your health or prosperity. Deciding it’s time for a change. Expressing an honest opinion. Shadow: Becoming distracted by melancholy thoughts. Longing for “the good old days.” Beating yourself up over lost opportunities. Judging your own work harshly. Holding others to inappropriate standards. Refusing to take part in a project, then whining about the quality of the outcome. Story: The Main Character looks back on what he or she has achieved and sees his or her work in a new light. Relationships. When this relationship started, what did you imagine it could become? To what extent have your expectations been fulfilled? If it falls short, you have two options: confront the difference … or revise your expectations. Which option is most likely to lead to happiness? Work. Fulfillment keeps work from becoming drudgery. What do you need in order to feel rewarded? To what extent is your current work providing this? A new project can breathe life back into a dull job. Be alert for opportunities to change your job without, necessarily, changing jobs. Spirituality. Which are you more likely to do: look back on wasted days or focus on a brighter future? The past is the past; let it go. If you haven’t achieved, spiritually speaking, what you hoped to achieve by now, deepen your resolve, set new goals, and pray for the strength to achieve them. Personal Growth. You can waste an entire lifetime wrestling with regrets. Escape the trap. Shift your focus from the past to the future, and resolve to make the most of the here and now. No amount of looking back can rewrite history; by contrast, working in the here and now can radically alter tomorrow. Fortune Telling. Things won’t work out as expected. Pick up the pieces and prepare to move on. When? Between May 11th and May 20th. 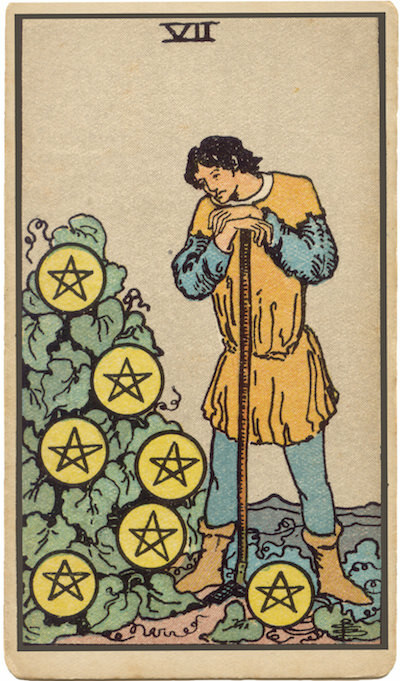 The Crop of Pentacles. RWS-inspired illustrations portray a vine or tree bearing a crop of golden Coins: the fruit of past labor. Take stock of what you have today, and consider how past efforts have contributed to your current situation. If you’re unhappy at all, change your strategy; to get different results, stop doing the same old thing. The Unhappy Farmer. RWS-influenced decks depict a man whose posture and expression suggest a level of exhaustion and regret that not even a bumper crop can alleviate. Most likely, his expectations were out of alignment with reality. What expectations do you have? How have these expectations shaped your efforts? Everyone’s a Critic. Each person sees his or her situation through a lens of his or her own making. What role might prejudices and assumptions play in your current situation? The Marseilles Image. Seven coins are balanced like berries on vines that sag beneath their weight. In your situation, how might further growth be limited by past performance? Might some items be ripe for picking—creating room for new expansion and growth? To what extent have I fulfilled my own expectations? What are the terms of success? How can I be happier with the progress I’ve made?